?Introduction?Pancreatic leakage is a common complication after gastrectomy. Pancreatic leakage and fistula formation are particularly serious and potentially fatal. 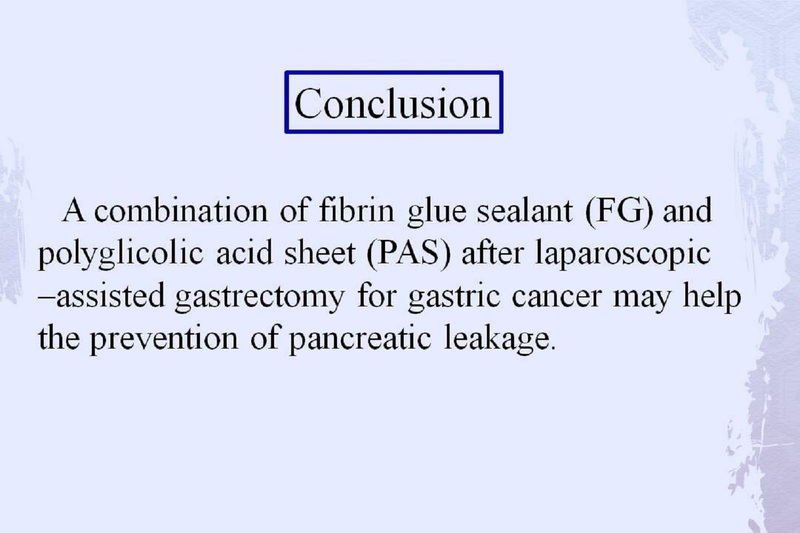 ?Objective?To prevent pancreatic leakage, we investigated the usefulness of fibrin glue and polyglycol acid felt after Laparoscopic assisted gastrectomy for gastric cancer. ?Patients and Methods?A retrospective study was carried out involving 86 patients who underwent laparoscopy-assisted gastrectomy for gastric cancer between January 2008 and September 2009. Of these patients, 66 underwent Laparoscopic-assisted distal gastrectomy (LADG) and 20 underwent Laparoscopic-assisted total gastrectomy (LATG). In 22 cases, we used fibrin glue and polyglycol acid felt around the splenic artery and the right gastroepiploic artery after laparoscopy-assisted gastrectomy for gastric cancer. Early on the first to third postoperative morning, fluid from abdominal discharge was collected for determination of amylase content. We evaluated the short-term outcomes and pancreatic fistula. ?Results?Mean age is 67 (range 36-81). 67 cases were men and 19 cases were women. According to the Japanese Classification of Gastric Carcinoma, 67 were stage?A, 10 were stage?B, 9 were stage?. The operation was undertaken with curative intent in all the patients.The standard D1 lymphadenectomy was performed in 74 cases, with D2 dissection in 12. Mean operating time was 205 (range 138-460) min. Mean blood loss was 90 (range 5-2450)ml. Blood. Reconstruction was by Billroth-? (n =36) or by Roux-en-Y (n =50). No patients had undergone splenectomy, Pancreatic fistula developed in 7 patients (LADG; 3, LATG: 4). No patients developed pancreatic fistula with fibrin glue and polyglycol acid felt. The patients without fibrin glue and polyglycol acid felt whose drainage fluid amylase levels on the first postoperative morning were significantly higher than those of patients with fibrin glue and polyglycol acid felt. Among 11 patients with amylase levels exceeding 4000 units on the first postoperative morning, six later developed pancreatic fistula , while only one of 75 with amylase levels below 4000 units did so. The patients with fibrin glue and polyglycol acid felt had no infection and intestinal obstruction. Of the patients with fibrin glue and polyglycol acid felt, three had anastomotic leakage. All complications were successfully managed and there were no deaths. The serum amylase level on the first postoperative day did not correlate with either the drainage amylase level or operative method, and showed no relation with the development of pancreatic fistula.
.?Comclusion?To use fibrin glue and polyglycol acid felt after Laparoscopic assisted gastrectomy for gastric cancer may help the prevention of pancreatic leakage.